Bread. Potato. Pasta. Rice. Cheese. Honey. Cereal (Weetbix, Coco Pops, Cornflakes, Sultana Bran, Oats, Just Right, Special K, Lowans Muesli). Dark chocolate. And these pies of course. Things you will never hear me say are my vices: cheesecake, lemon tart/pie/slice, white chocolate, ice cream, alcohol, cookies, soda, fruit juice. I am not including in this all the healthy things I love: yoghurt, every fruit in the world minus watermelon and blackberries, sweet potato, spinach, wholemeal wraps, etc. Sorry for the unintentional blog break there, but I spent all weekend with my grandparents and dad, and then was too exhausted to write anything. I had such a lovely time with them - it was great to see them all as I hadn't seen them in ages. We spent the weekend eating and going to see the Brisbane Roar - who won the A League final for the second year in a row - scoring both goals in the last eight minutes of the game! This week's WIAW includes a day of the lovely eats I enjoyed when they were here. 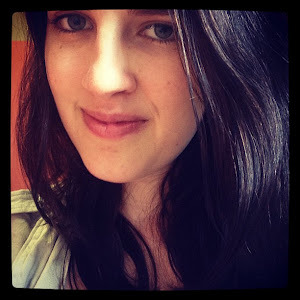 And in a further exciting note, these are the last pictures on my blog with my old camera. My wonderful father bought me a new one - a proper one, which takes absolutely brilliant photos. I am so excited about this! Oh, and in a quick side note, today I got my first Healthiful Balance newsletter, which was really good fun to read - so congrats to Shannon and the rest of the team - it's great fun to get! So back to the steak and mushroom pies. These are my mum's pies. I remember eating six or seven of them in one sitting and feeling absolutely awful, but eating another six or seven for lunch the next day. 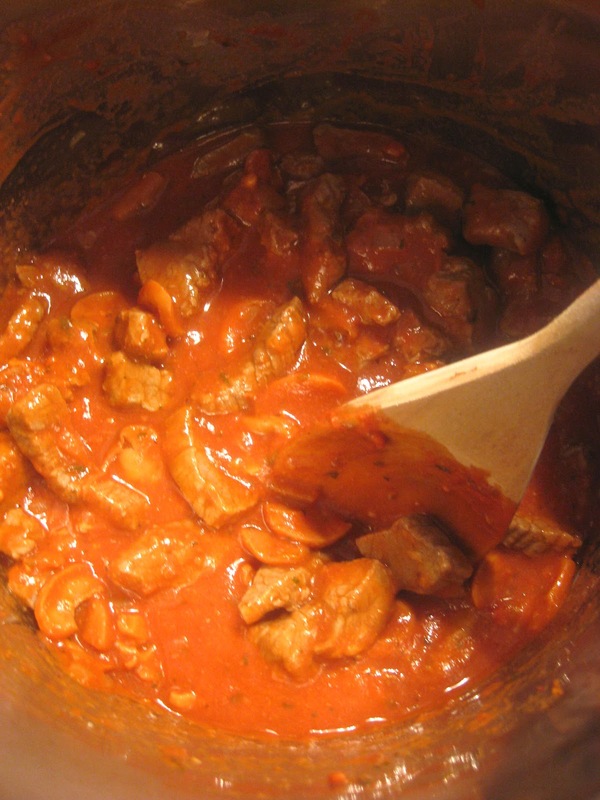 The tomato paste is thick, the mushrooms soft and the beef wonderfully tender. These pies are brilliant when straight from the oven, but even if you take them to work or school cold the next day, they taste just as delicious. Level of Difficulty: Easy – a little time consuming but no difficult techniques are required. I recommend waiting for a rainy day, then having a Friends/Harry Potter/New Girl/Doctor Who (or whatever tv show/movie you like) marathon while making these. The house will smell delicious. Menu Options: If I make a big pie I serve it with mash potatoes and some steamed or baked veggies. If I make mini ones, I pretty much just eat them. Heat two-thirds of oil in a large saucepan/frypan on medium to high heat. You will need a large saucepan to make the gravy, but I use a frypan to brown the meat. Brown beef, in batches if you have to, transferring beef to a large bowl to wait for rest of cooking to be done. I changed from using a frypan to using a large, heavyset saucepan, with a little oil, on medium heat. Add remaining oil and onion and fry for three minutes over medium heat. Add mushrooms and cook for a few minutes, or until soft. Return beef to saucepan. Add flour, nutmeg and tomato paste. Stir for about one minute. If you don’t like a very thick tomato gravy, then add half a cup of tomato paste. However I recommend trying it with the thick gravy. Add the Worcestershire sauce and the stock. Season with salt and pepper to taste. Add the half cup of water. The flour will make the mixture very thick, so the water is needed to thin it out. Be careful, you don’t want too much water because the mixture is going to go in pies. With the lid on the saucepan bring the mixture to a boil. Once bubbling, reduce the heat. Allow the mixture to simmer for 1 hr and 15 minutes with lid on saucepan. Stir regularly. Defrost the pastry you are using. Do this about five minutes before you need to make the pies. 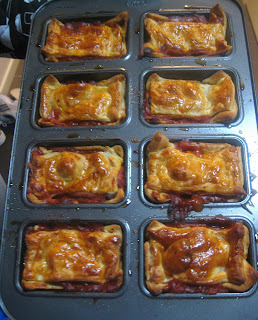 Grease muffin tin holes/mini loaf pans with butter or oil. Do this liberally as we want the pies to come out easily. Line each muffin/loaf hole with shortcrust pastry up to the rim. I use a cup that is a cm or so bigger than the muffin holes to cut circles into the pastry. The cup will cut through the pastry and you can peel it away to line the tray with. 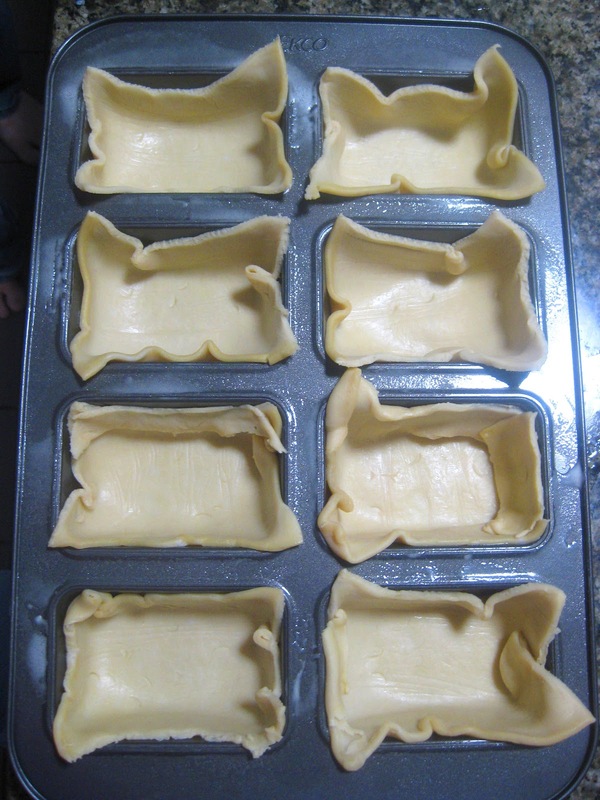 If doing this in mini loaf pans, measure the mini loaf size and, adding a cm either side of the rectangle, rule out on the pastry the size of the pan. Using a knife cut out a rectangle and line the tray with the pastry. Spoon filling into muffin/loaf holes. 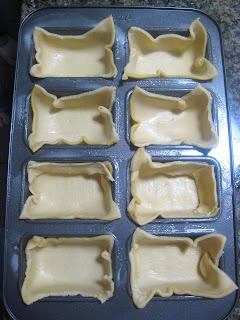 Cut circles/rectangles of puff pastry to fit top of pies. 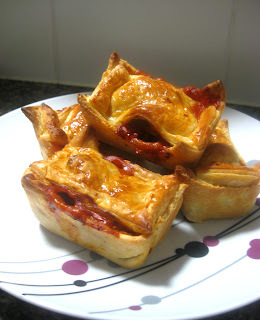 Press puff against shortcrust pastry to seal each pie. 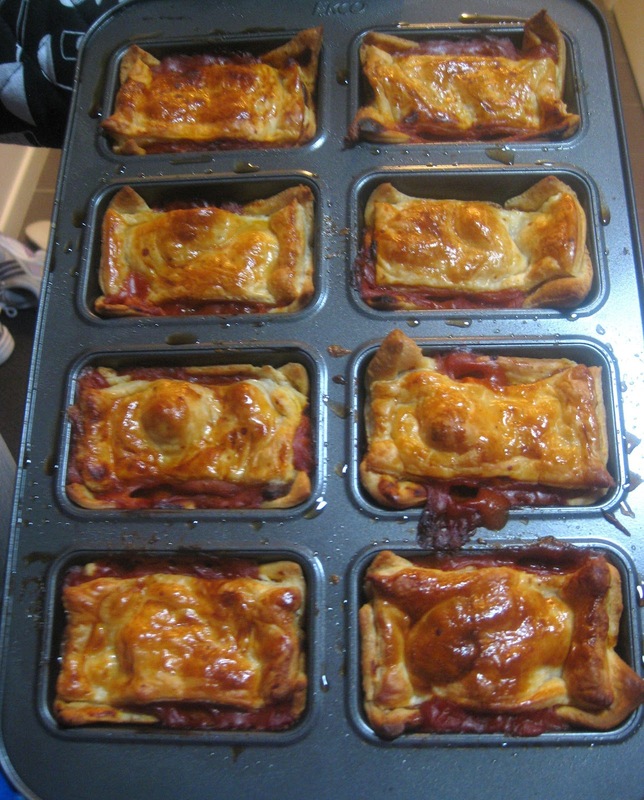 Brush pies with beaten egg and make a small hole in centre of pie to release steam (poke with a fork). Bake pies for 10 mins. 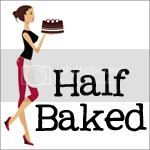 Reduce oven heat to 160 degrees Celsius and bake for 20- 25 minutes. The top of the pies should be flaky and a lovely golden brown. Be careful not to burn the pastry. 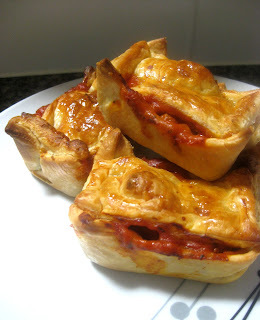 Wow, I love everything about this recipe, down to the awesome pan you made the little pies in. I'm big on steak (and mushrooms) and anything pot pie-like is simply fantastic. Great recipe!